This is a simple simulation of rocket flight from earth's surface to Mars. This project aims to simulate a rocket flight from Earth's surface to Mars. The solution has been divided into three parts: the flight to earth's lower orbit, inter-planetary flight and the landing. * Rocket's mass loss is concentrated at two fixed points. Real rockets have various stages of flight when they drop off fuel containers when emptied. In ths project, the first "dropping" is done when escaping earth's lower orbit and after reaching Mars's orbit. The rocket is propelled by an initial 2-dimensional force and continuded to do so until it reach es a certain time. Then, the force of perigee is acted on the rocket. After it tends to reach apogee, a new force is applied on the rocket. 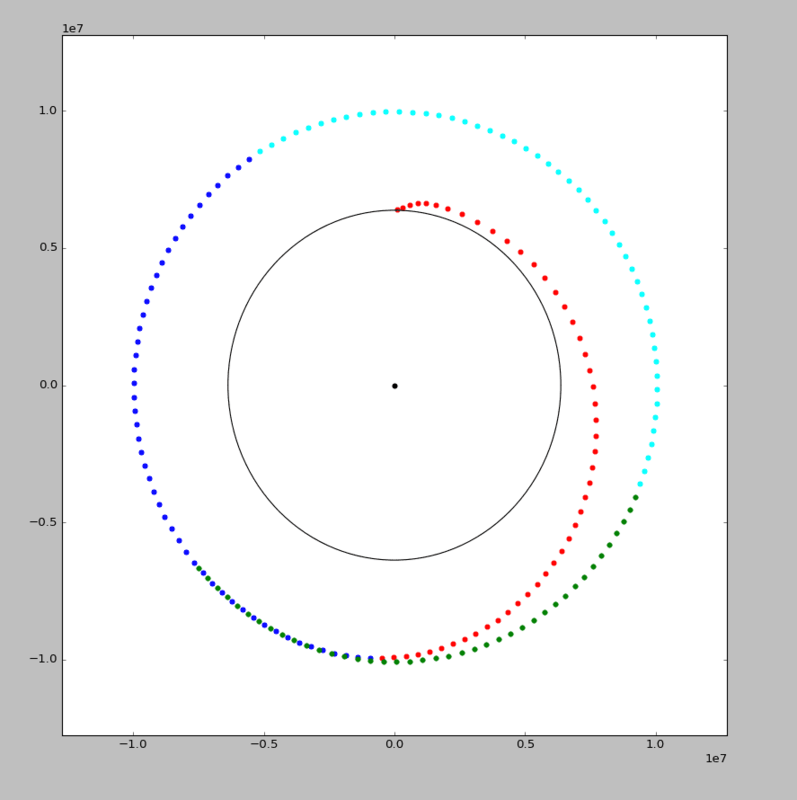 After applying this force, the rocket seemingly looks to be in a sta ble, circular orbit. The rocket's position and velocity are adjusted according to the results from the previous experiment. The rocket is propelled until it reaches a distance from sun equal to Mars's orbit. 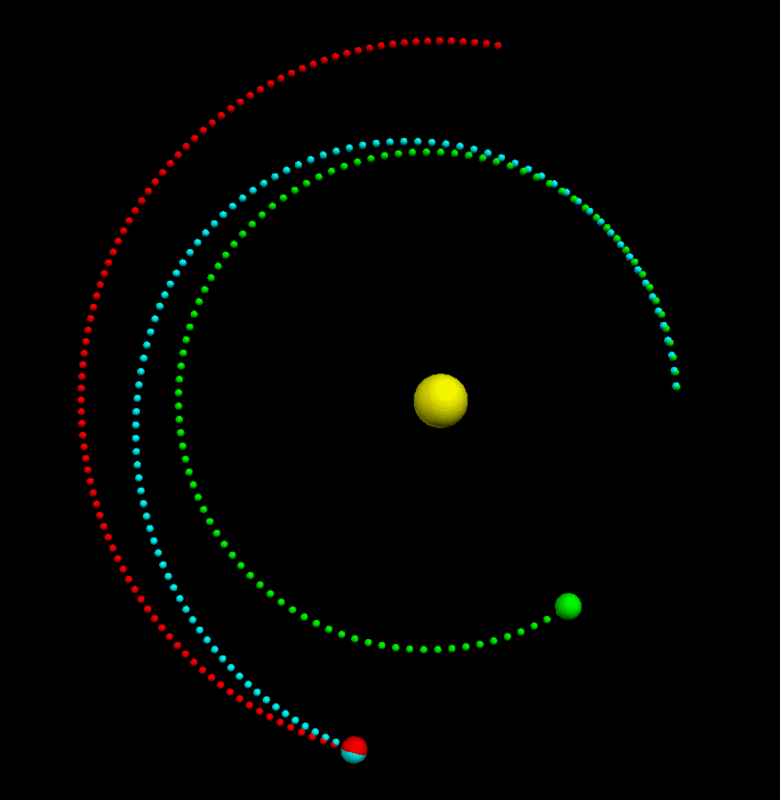 The position of Mars is adjusted close to the point when the rocket reaches the red planet's orbit. Earth and the Mars are given an initial speed using Earth's fact sheet and Mars's fact sheet. It is assumed that the sun's effect is negligible until Earth's lower orbit. After leaving the Earth's orbit, this assumption is no longer considered and all the gravitational pull are considered. For all of the objects(Earth, Mars, the Sun and the rocket), gravitational pull from all bodies are considered and applied simultaneously. As an example, the rocket is pulled by the sun but the same pull is applicable to the sun by the rocket. 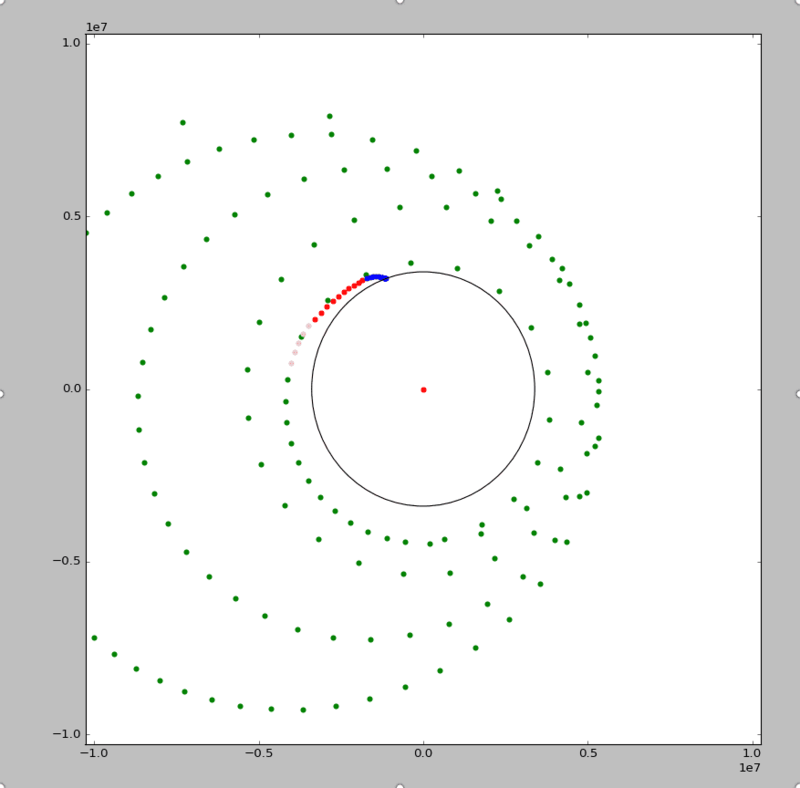 Since an n-body gravitational pull algorithm is used, extra bodies can be added. For example, to add Earth's moon, import moon from physical_object.py and register it on the "world" using moon.register. See physical_object.py for more details. The rocket's position and velocity are mathematiclaly translated such that both the position and velocity of Mars are on the origin. For certain time, at perigee, the rocket is pushed back by a force in opposite direction of it's velocity.